I feel like everyone has moved beyond Christmas. 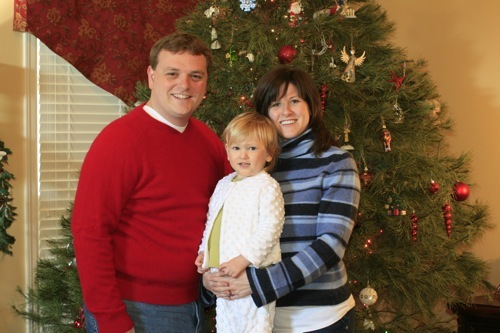 I am running a little behind, so I’m just getting around to posting our Christmas pictures. Christmas started with brunch at the Betbezes on Christmas Eve. I really like this tradition. We enjoyed brunch then the kids began opening presents. 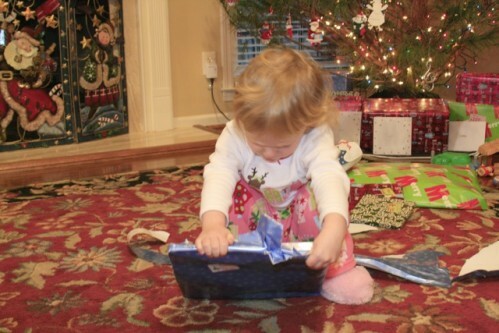 Samantha got lots of great gifts, but the #1 score (in her eyes) was a new shopping cart from Great Aunt Mary. She barely had the patience for her daddy to put it together. Goodness. After naptime, we headed to mass. It wasn’t as crowded as usual, so we actually had a whole pew to ourselves. 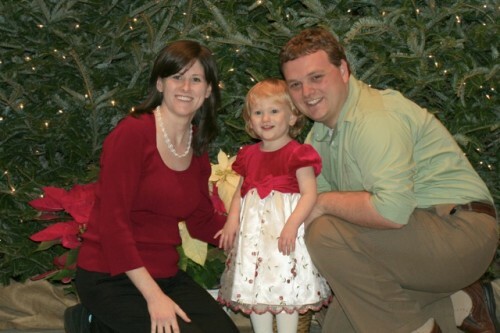 Our friend Kris took this family shot after mass. It’s one of the few times that Samantha has actually smiled for the camera. Thanks, guys! We came home, had Chicken Tortilla Soup (yum) then nestled all snug in our beds. On Christmas morning, we got up and opened presents. Samantha got a few books and some hand glove puppets from Santa. The hit was the Abby Cadabby magic wand book she got. I like this shot because it shows Sam in her Christmas PJs and slippers, inspecting her new book. As we were packing the car and getting ready to drive to Huntsville, I went to feed the cats. We didn’t arrange for anyone to stop by because we were only going to be gone for a few days. However, I discovered that we were almost out of cat food. As in, we didn’t have enough to last a few days. Uh oh. It was Christmas morning, and I was sure that no store was open that carried our cat food. Luckily, the Grissoms came to the rescue. Thanks for buying our cats’ food and taking it by the house to feed them!! We drove to Huntsville in time for lunch. The kids were getting ready for their naps so we hurriedly opened presents. Wow, what craziness. If I had to guess a favorite from that bunch, it would be the keyboard from MamaLinda and Pop. Now Samantha can play the piano and push lots of buttons while her daddy is playing too. She loves dancing to the beat. 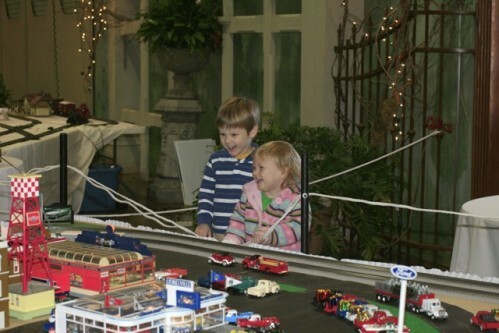 On Boxing Day, my mom and I went out shopping while the boys and kids went to the Train Exhibit at the Botanical Gardens. I think it was a hit. Of course, anything involving Jackson is sure to be lots of fun. See a previous post. On Sunday, we traveled over to Florence to spend some time with Brian’s family. We enjoyed getting to see everyone. We opened presents that night then spent a few days relaxing and playing games. 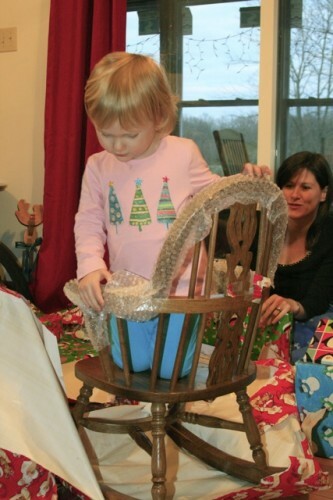 Samantha’s favorite gift was the rocking chair from Nana and Papa. She loves it! 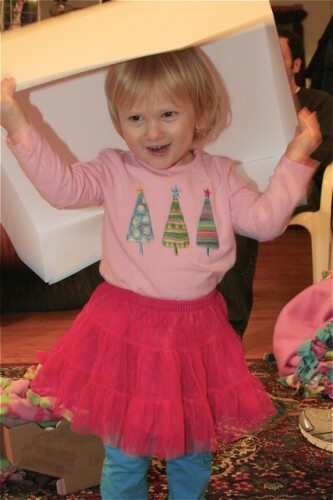 She also loved Chloe’s skirt and playing with wrapping paper, tissue paper and boxes! Hey! Where did this come from? I just randomly was checking, looking for your usual pictures. Congrats on the new format! What a great family photo! Sam’s getting the hang of it! The trick with Sam is to let her stand. If we try to hold her, she fights it.